New Tricerabox 3-Point Hitch Box Blade | K-Tec Earthmovers Inc.
K-Tec Earthmovers have released a new accessory for 500+HP Tractors to enhance earthmoving operations. The K-Tec Tricerabox is a 14’ wide box blade that is mounted to the 3-point hitch on the rear of a tractor. 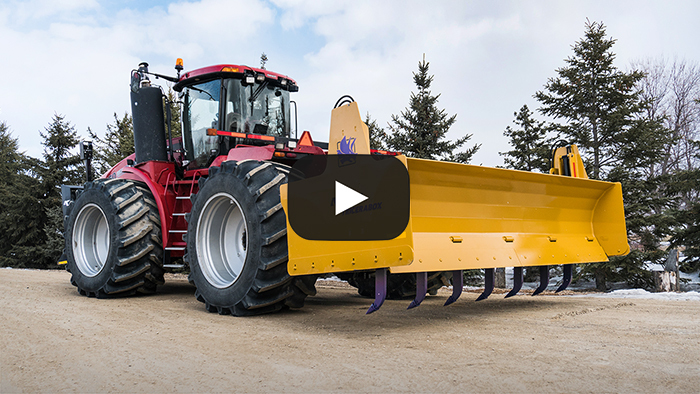 The three functions of the Tricerabox include the leveling blade pulling material forwards, ripper teeth sinking down into the soil, and blade backwards for pushing dozing material. The blade is ideal for leveling out uneven cut zones, to prepare a productive loading area for enhanced scraper productivity. It has seven ground ripper shanks that are hydraulically operated to lower for engaging the ground for ripping up hard soil or aerating wet jobsites. The Tricerabox back blade allows for the operator to complete backfilling of soil work to fully smooth out the cut and fill zones. The 3-Point Hitch may also be modified to have a scraper hitch hook-up, making it the ultimate piece of support equipment, where the tractor can fill in as a bulk dirt hauler for another power-unit that may be down for maintenance. Watch the K-Tec Tricerabox in action here.